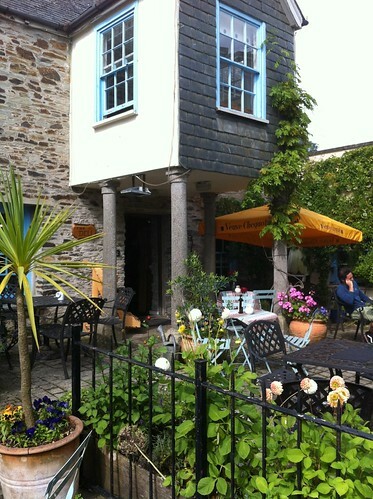 One of my favourite places when I went to Cornwall this year was the Courtyard Deli in Falmouth. 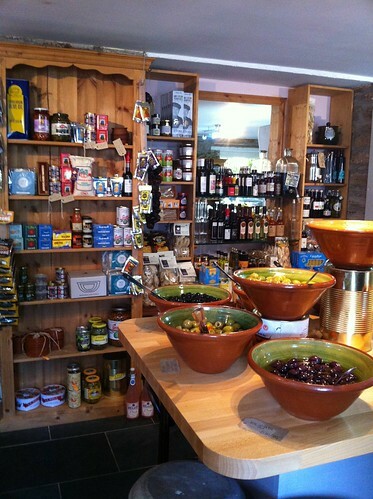 A hidden gem, this gorgeous deli provided me with two of my favourite meals on holiday. (Who am I kidding, I didn’t eat anything that wasn’t amazing on holiday this year!). One was a lovely picnic, which I’ll discuss in a later post, and the other was a lovely tapas meal that we enjoyed on our final evening. The Deli does tapas three nights a week, and it was incredibly quiet when we went on the Friday night – so quiet we were the only ones there for most of the time. Usually, this would be a sign of bad food, but I am pleased to report that this was certainly not the case! They definitely deserve to have people knocking the door down to get in, so if you’re local to the area, make sure to plan a visit, you won’t be disappointed! As my husband is a massive carnivore, we decided to start off with a meat sharing platter. To be honest, I thought this would be a little bit boring – I do love cured meats, but it’s very simple to make something like that yourself, and to be honest, I wasn’t expecting much. 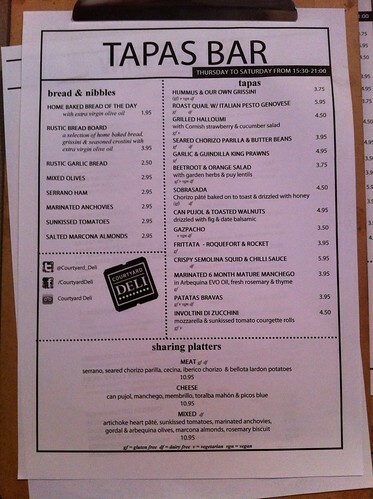 So, I was pretty pleased when it arrived, and was utterly delicious! 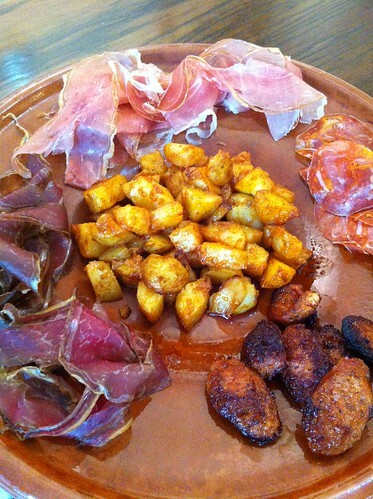 The potatoes were waxy and fresh, and the chorizo was a real standout – juicy, tender, salty and crisp. I’d never enjoyed chorizo as much as I enjoyed this simple, fried offering, and I’m a pretty big chorizo fan anyway! 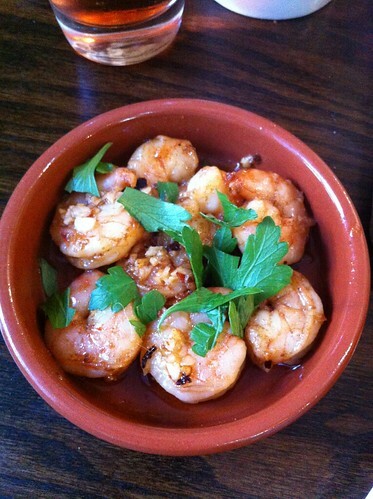 I also had some garlic prawns, because I made a pledge to myself I would eat seafood every day while in Cornwall. I love seafood but my husband hates it, so I never really get to eat it that often. Hooray for holidays! 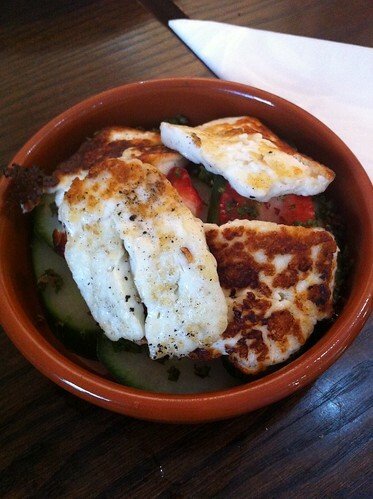 Om nom nom – this was halloumi cheese and strawberries – a weird combo that tasted oh so right! The salty, squeaky cheese went perfectly with the soft, sweet strawberries. I’ll have to try this at home! 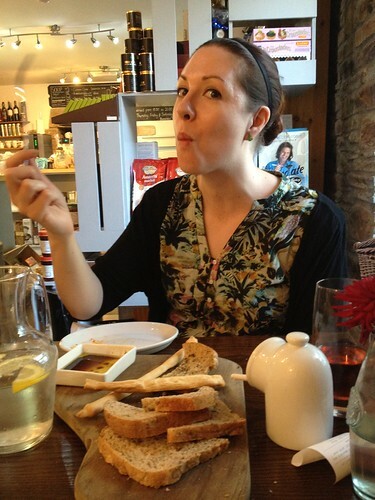 We also had a pretty standard bread platter (although, no white bread? 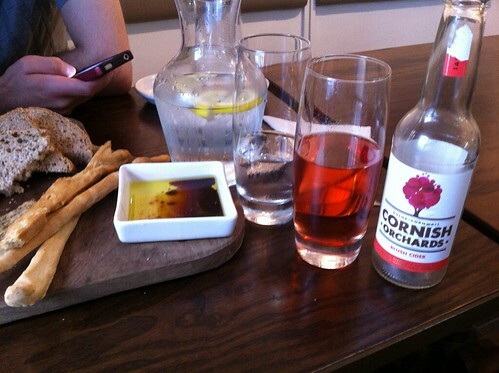 Strange…), and I enjoyed a deliciously sweet blush cider. 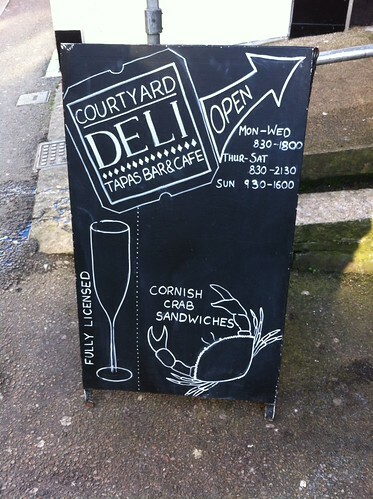 I would definitely recommend a visit to the Courtyard Deli – friendly staff, great food – what else do you need? !